Santiago shows the difference between a regular person and a peacemaker. There are no coaches, no players, no games, unless someone lines the fields. Thank you Glen! Glen with the paint machine. This is a repost from a previous newsletter. Wanted to get this online. Glen is still working hard for our community, and this article barely scratches the surface. Glen Bethel is one of the most important members of the RYAA community, but he wouldn’t tell you that. His unassuming, casual exterior belies the industrious and focused disposition that lies beneath. RYAA’s extensive athletic programming would not be able to exist without a foundation; Glen provides the glue that helps that foundation to exist. The repair, maintenance, and oversight of the sports fields that RYAA uses is an extremely daunting task that is far more difficult than it may sound. Glen’s father has a certificate for being a fifth generation Wisconsinite. Growing up in Wisconsin, Glen found a passion for the sciences and began to study chemistry at the University of Wisconsin. Soon, he began working as a chemist helping to manage the laboratory there with Torelir Bilstead. After two years, he came to California, where he made his way to Palo Alto. He finished his studies in electrical instrumentation at Foothill College, and then began working for the City of Palo Alto at their water treatment plant. One way Glen developed his passion for athletics was through his love of cycling. Glen rides on average about fives days a week, with a minimum of five hours a ride. One only needs to look inside Mr. Bethel’s garage to see how serious he is about riding; the walls and ceiling are covered with bicycles of all kinds and sizes. For about twenty-five years, Glen rode to work as well, until his recent retirement. Often, he’s ridden to the coast or cycled off-road at Montebello. Cycling affects all the facets of life for Glen; he is able to work and think better on the whole because of the outlet provided for him in the saddle. Glen began maintaining the fields because he simply saw a need that he could help with. 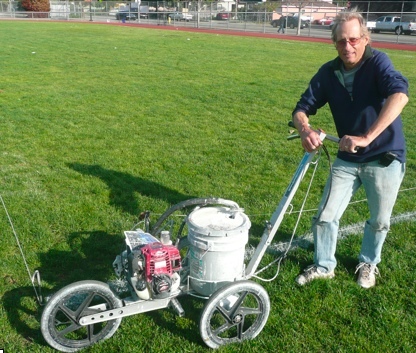 Because of the heavy use, and lack of funds, the local school district was not able to maintain the fields at a level needed for safe soccer play. Glen began by making adjustments to the watering system, and eventually learned to make sprinkler repairs. Thanks to a generous gift from Menlo Park Presbyterian Church, he was able to obtain an industrial lawnmower to ride and cut the grass properly. He also makes sure there are enough trash cans on the field so that at the end of the day, there is less trash on the field than when we began. Some days, he focuses on the perpetual gopher problem, and has become our expert on gopher control. Glen organizes volunteer groups to help maintain the fields as well. He has devised a system that starts with aeration, then is followed by seeding and fertilizing. Glen is especially proud that his renovations have helped to create a sense of community pride. Teams from out-of-town who come to play here have an immediate first impression of quality and care, and remark at how great the fields are. This, in turn, sets a standard for the surrounding communities to match, helping more than just RYAA and its field. His work also directly benefits the school, whose children use the fields for PE, recess and athletics. Glen Bethel is an incredibly humble and sacrificing member of our team. We can’t praise him enough for his concern and dedication to our community. New article about the facility fee raises at the school district.